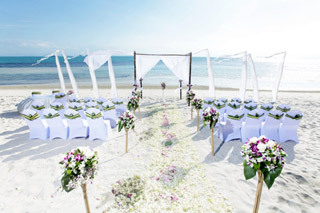 Thailand has become one of the world's most popular choices for destination weddings. Husbands and wives to be from a vast array of countries head to famous beaches on islands like Phuket and Koh Samui looking for the ideal place to exchange their vows. With professional agencies such as Signature Weddings on hand to organise and manage the special day, couples can guarantee that their wedding fits whatever needs and expectations they bring from home, with a wealth of choices on offer to guarantee a memorable beginning to wedded bliss. 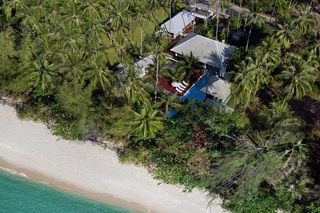 The venue is top of most couple's list and Thailand's renowned holiday islands now offer an appealing selection of quality private villas available luxury rental accommodation. These residences provide newlyweds with the ultimate venue for a private gathering, as well as the perfect place to spend their dream honeymoon. Alternative locations such as restaurants and oceanfront bars are also possible to hire, so the choices are as diverse as they would be back home, but often with a much more affordable price tag. "Even at the luxury end of the pricing ladder, and taking into account the cost of flights and other travel arrangements, a personalised wedding in Thailand is still regarded as a bargain in comparison to an equivalent event in the west." When the couple and their guests arrive for the big day, the best agencies in Thailand have a team of trained staff on hand to manage everything smoothly and effortlessly on the ground. Theses can include everything from experienced celebrants to lead the ceremony, to dedicated chefs, flower arrangers, tailors and photographers. A choice of entertainment and live music is also available to make sure the party a memorable one and with a choice of dream locations, the photographs and videos will certainly make anyone who misses the event wish they hadn't. There's little doubt that holding a wedding in a luxury private villa is one of the most alluring choices available to couples looking to marry in Thailand. The couples can say their vows next to private infinity pool overlooking the ocean or stand on the beach and pledge their troth with the warm Thai waters just a step away. Once the ceremony is complete, family and friends can relax and socialise in surrounded by a range of modern comforts and savour a delicious meal of Thai and western cuisine, specially prepared by the villa's own private chef. "Thailand a very special location for a wedding. What's more, the country's widely acclaimed service culture means no corners are cut or details omitted when it comes to creating the perfect day." Weddings are considered major events for Thai people. As one of the most important ceremonies in person's life, they are therefore meticulously planned and carefully managed. Elaborate decorations and personal touches are considered essential , and with high standards of service provided by agencies like the Signature Weddings, the country's reputation as a dream destination continues to grow.